Developmental hip dysplasia casefile tells you more about chiropractic. Developmental hip dysplasia casefile usually have groin and upper leg pain as the commonest complaint; but that's not always the case. Miss S is a 21-year old young woman. Six years ago she began to get pain in the upper lumbar spine. She's not quite sure when the pain in the front of the upper thigh and groin began, but she thinks it was after her back. The last year or two walking became a misery, and 'op stap' (what young people do in the evenings and over the weekend, walk gezellig in the town with their friends, sometimes perhaps a pub-crawl!) became impossible. She consulted me for the first time five months ago. On examination her pelvis was level, but there was an obvious severe right sacroiliac joint fixation. SIJ tests were negative though. Forward flexion, and extension were tight in the low back, and rotation to the left caused quite severe pain in the upper lumbar spine; these findings are much in common with conditions other than a developmental hip dysplasia casefile. The reflexes were normal, and there was no loss of muscle power, but there were definite sensory changes in the front of her thigh on pinwheel examination. Hyperesthesia is an increased prickle when testing the skin. A test for femoral nerve by stretching it was positive. Range of motion of the right hip (and the left to a lesser extent) was greatly increased. Internal and external rotation was especially hypermobile giving rise to a suspicion of developmental hip dysplasia. 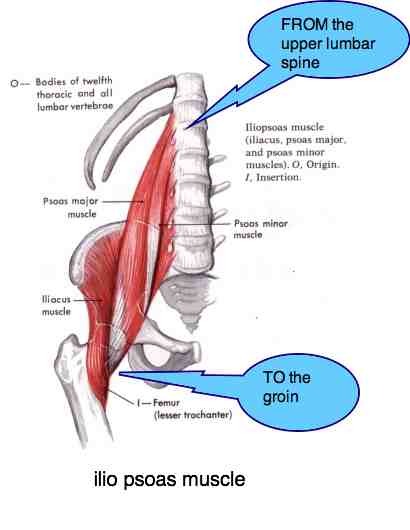 The insertion of the iliopsoas muscle in the groin was exquisitely painful. In the infant, your chiropractor will be doing the tests of Ortholani, Galeazzi and Barlow. 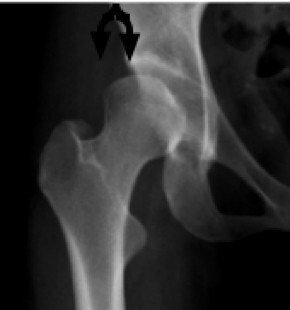 A mild case of Developmental Hip Dysplasia was immediately evident in the right hip, and to a lesser extent the left hip. A very shallow socket, with a sloping roof, explaining why the hip range of motion was greatly increased. In the upper lumbar spine there was no obviously abnormalities of the bones themselves, or the joints, but the abrupt change from a lumbar lordosis at the thoraco-lumbar junction told a story of spinal dysfunction. Upper leg pain is a common complaint as the ball subluxates in and out of the socket. Notice how a large part of the ball of the femur is unroofed - it protrudes nearly one third beyond the boundary of the acetabulum; that's typical of every developmental hip dysplasia casefile. Developmental hip dysplasia casefiles are interesting in that sometimes the presenting complaint is high lumbar pain, and to a much lesser extent hip and groin discomfort. It was only on further questioning about what aggravated her condition, what was limiting and if there was radiation to the leg that she spoke about the stabs in the groin. Perhaps that was due to her extreme shyness. 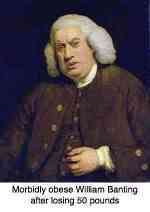 She declared later that another doctor had been rather 'personal' about the pain in the groin. In fact she was extremely diffident, and it took some weeks for the whole story to come out. It's for this reason that I encourage patients with groin conditions to bring a partner or parent with them. 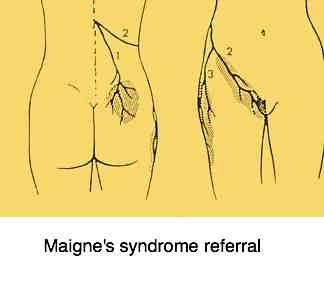 More traditionally we speak of two conditions, Meralgia Paresthetica and Maignes Syndrome that radiate from the upper lumbar spine to the upper leg and groin. Sexual advances chiropractor do occur very occasionally, but in this instance it was a medical doctor. When faced with any incurable condition, one is forced to return to the basics of good health. A disciplined exercises programme is usually one of those basics. This is an exercise that I have been working on for some years to perfect, to strengthen the muscles of the hip. It's quite complex, so I've divided it into three parts. Perfect part 1 before moving on to part 2, to part 3. It takes about two minutes on your bed before arising every morning. Chiropractic help progress for chronic conditions is usually slow but Miss S has responded better than expected. The treatment of her back turned out to be more or less routine, but the treatment of her groin pain was excruciating for the first half dozen treatments; that's not uncommon in the management of each developmental hip dysplasia casefile. She didn't get bruises in the inner thigh, but it does happen. More parsley benefits by the way will help. She does her exercises faithfully, has accepted that running is not for her, and even a low amble over the weekend can also be very trying. 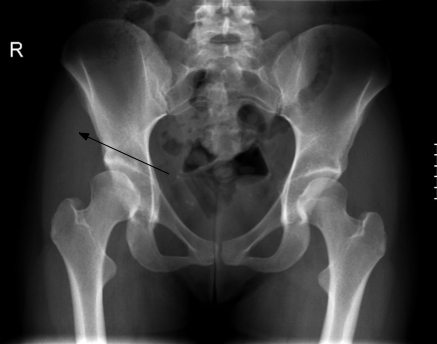 Hip arthritis is a common sequela if a developmental hip dysplasia casefile isn't well managed. The average person might take about 70 million steps in a lifetime. A bad case of hip dysplasia might walk less than half of that before wearing out and requiring a total hip replacement. A mild case might make the full 70 million steps, but with pain in the latter years. Best to assume your hip might only manage 40-50 million steps, so jogging and long hikes are not sensible. Walk for fitness, but within moderation. Rather cycle and swim when possible. She comes faithfully for her consultation every six weeks, mindful of how she has suffered and doesn't want a relapse now. She cycles everywhere, to work, to the theatre, to her violin lessons, and reserves walking for special occasions. Unfortunately neither I nor anyone will cure her, unless she is ready to attempt radical re-shaping of her pelvis; read lower down. Like diabetes, high blood pressure and a heap of medical conditions, Miss S has accepted that she has an incurable, but treatable condition. Her life is good; but not perfect. It isn't for most of us. "I just wanted to let you know how interesting I found your Chiropractic Help Hip and Groin pain newsletter on hip dysplasia. Having just been diagnosed, Jan 2009, with Congenital Hip Dysplasia, and having undergone two Periacetabular Osteotomies, it is nice to see that you know of the condition - so few people do - most think it is something that dogs get! I continue to read with interest, all your articles. Thank you. I shall be passing this on to the ladies at the hip women yahoo group."